Inside Track Q&A – The Irish Times. Home / Press / Inside Track Q&A – The Irish Times. 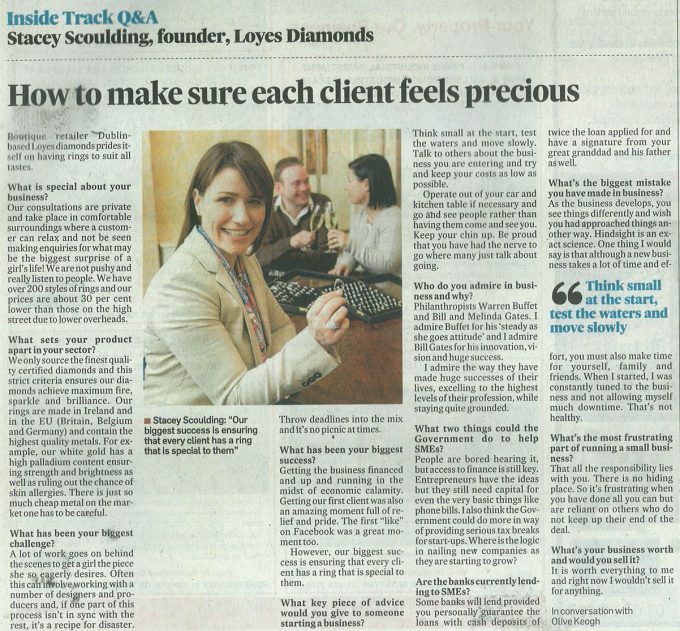 Stacey Scoulding, Founder, Loyes Diamonds. How to make sure each client feels precious. Boutique retailer Dublin based Loyes Diamonds prides itself on having rings to suit all tastes. Q. What is special about your business? Our consultations are private and take place in comfortable surroundings where a customer can relax and not be seen making enquires for what may be the biggest surprise of a girls life! We are not pushy and really listen to people. We have over 200 styles of rings and our prices are about 30% lower then those on the high street due to lower overheads. Q What sets your product apart in your sector? We only source the finest quality certified diamonds and this strict criteria ensures our diamonds achieve maximum fire sparkle and brilliance. Our rings are made in Ireland and in the EU (Britain, Belgium and Germany) and contain the highest quality metals. For example, our white gold has a high palladium content ensuring strength and brightness as well as ruling out the chance of skin allergies. There is just so much cheap metal on the market one has to be careful. Q What has been your biggest challenge? A lot of work goes on behind the scenes to get a girl the piece she so eagerly desires. Often this can involve working with a number of designers and producers and if one part of the process isn’t in sync with the rest it’s a recipe for disaster. Throw deadlines into the mix and its no picnic at times. Q What has been your biggest success? Getting the business financed and up and running in the midst of economic calamity. Getting our first client was an amazing moment full of relief and pride. The first “like” on facebook was a great moment too. However our biggest success is ensuring that every client has a ring that is special to them. Q What key piece of advice would you give to someone starting a business? Think small at the start, test the waters and move slowly. Talk to others about the business you are entering and try and keep your costs as low as possible. Operate out of your car and kitchen table if necessary and go see people rather then having them come see you. Keep your chin up. Be proud that you have had the nerve to go where many just talk about going. Q Who do you admire in business an why? Philanthropists Warren Buffet and Bill and Melinda Gates. I admire Buffet for his ‘steady as she goes attitude’ and I admire Gates for his innovation, vision and huge success. I admire the way all 3 have made huge success of their lives, excelling to the highest levels of their profession while remaining quite grounded. Q What two things could the government do to help SME’s? People are bored hearing it but access to finance is still key. Entrepreneurs have the ideas but the still need capital for the very basic things like phone bills. I also think the Government could do more in the way of providing serious tax breaks for start-ups. Where is the logic in nailing new companies as they are starting to grow. Q Are the banks currently lending to SME’s. Some banks will lend provided you personally guarantee the loans with cash deposits of twice the loan you are seeking and have a signature from your great granddad and his father as well. Q What’s the biggest mistake you have made in business? As the business develops you see things differently and wish you had approached things another way. Hindsight is an exact science. One thing I would say is that although a new business takes a lot of time and effort you must also make time for yourself, family and friends. When I started I was constantly tuned to the business and not allowing myself much downtime. That’s not healthy. Q What’s the most frustrating part of running a small business? That all the responsibility lies with you. The is no hiding place. So its frustrating when you have done all you can but are reliant on others who do not keep up their end of the deal. Q What’s your business worth and would you sell it? It is worth everything to me and right now I wouldn’t sell it for anything.